The third day of my holiday based in Tyndrum saw me heading off early in the morning to catch the overnight sleeping car train from London to fort William as far as Corrour. Having checked the train was running on time, using my mobile phone I left the hotel armed with plenty of provisions, as there was always the possibility that I might not be in time to catch the 18.25 return service. 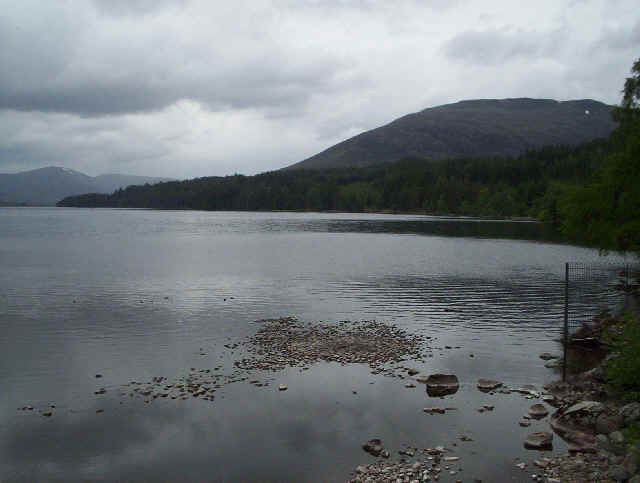 The plan was that, if things went wrong, I'd have a meal at the Corrour station restaurant. 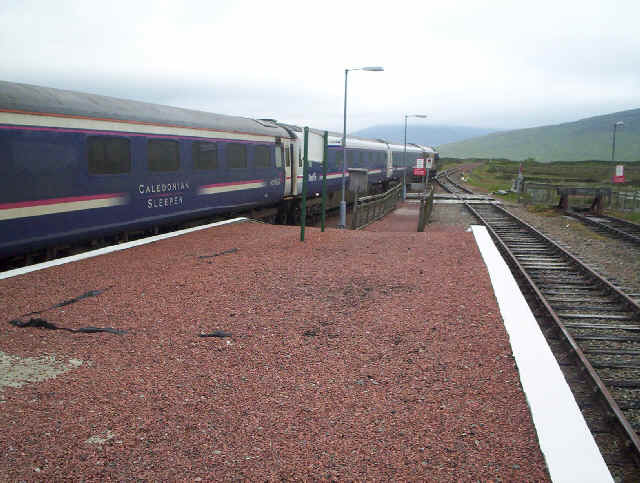 Here the train is pulling out of Corrour where a surprising number of passengers embarked and a few got off. Leaving the station just after nine I headed off down the "road" towards Loch Ossian. 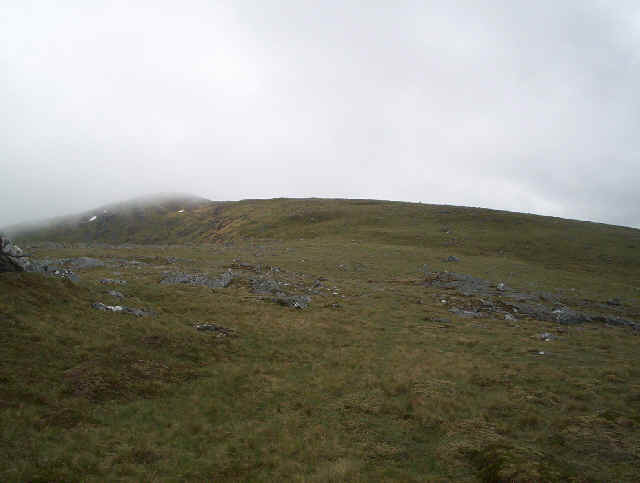 The weather was a little freary with clouds down to below the summits and the forecast was for showers or thundery spells. Neither appeared and the day stayed dry and generally brightened up. 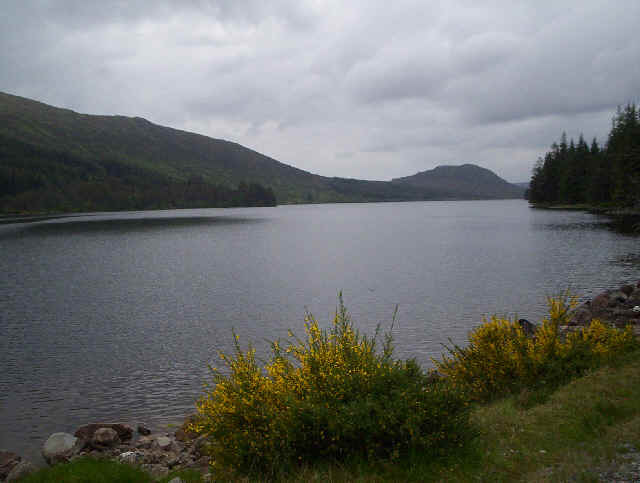 I took the road along the south side of the loch past the youth hostel. Just beyond the hostel a marked path (The Road to the Isles) heads off eastwards across the slopes below the crags of Meall na Lice. 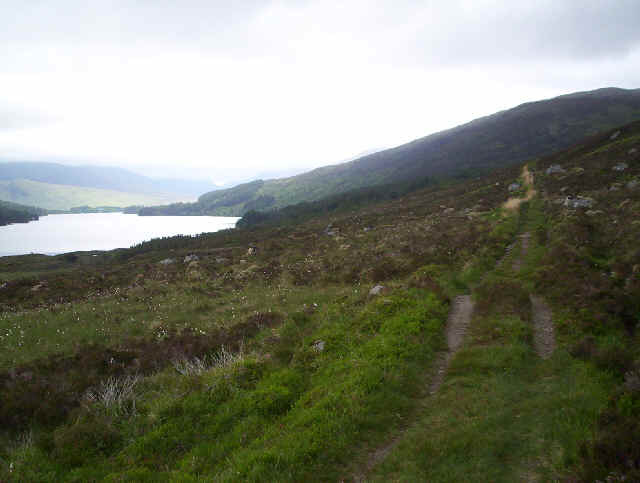 The track climbs slowly away from the loch and I was able to make good time. 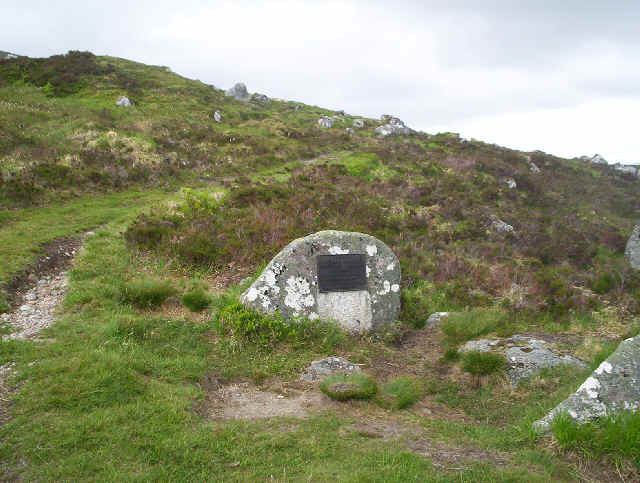 This is "Peter's rock" a memorial stone to a young 29 year old man who knew this area. 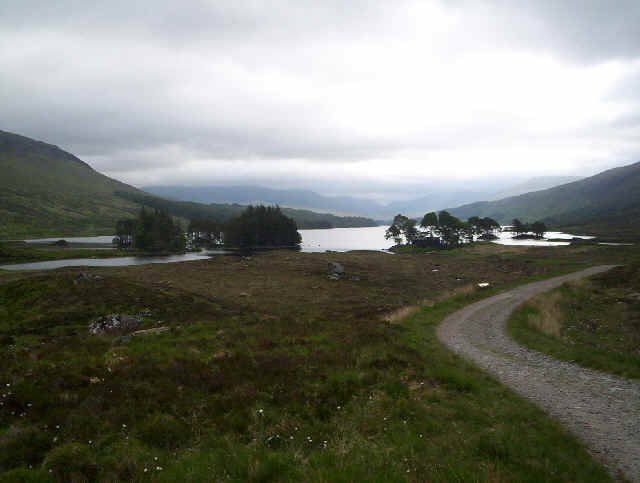 It's at the junction of another path which comes up from half way along Loch Ossian. It had taken about an hour to reach this spot. 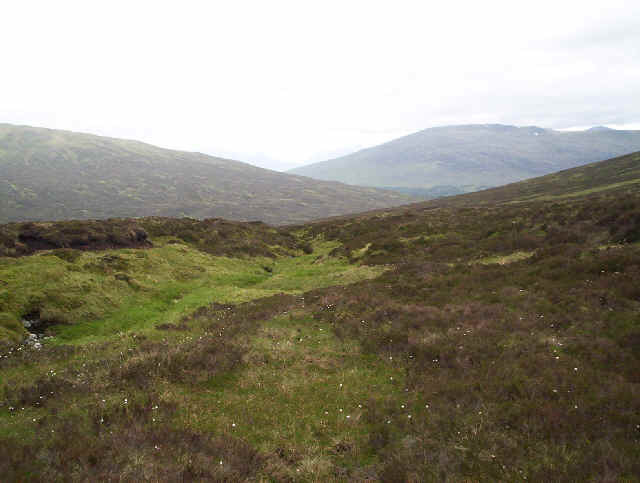 I immediately left the track here and headed due east across the moor towards Meall na Leitire Duibhe, where I intended to join the main ridge to Carn Dearg. The photo shows the view looking backwards. Obviously, there's no track and it's a bit of a slog. In places it's a bit boggy with peat hags. 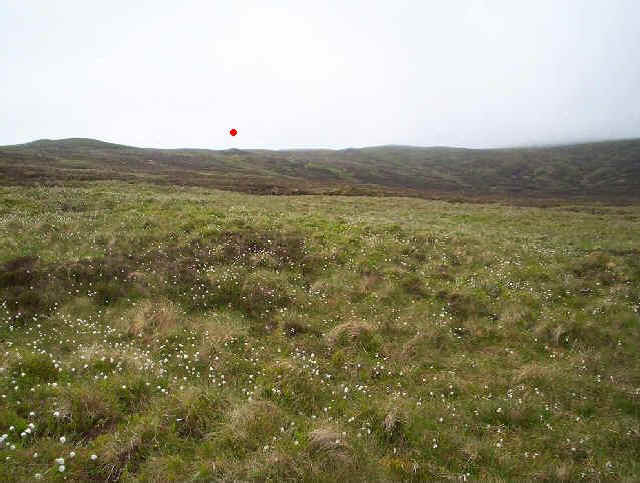 The cotton grass is in full "bloom" and I've decided I'm heading for a prominent rocky outcrop on the skyline where the red dot is. 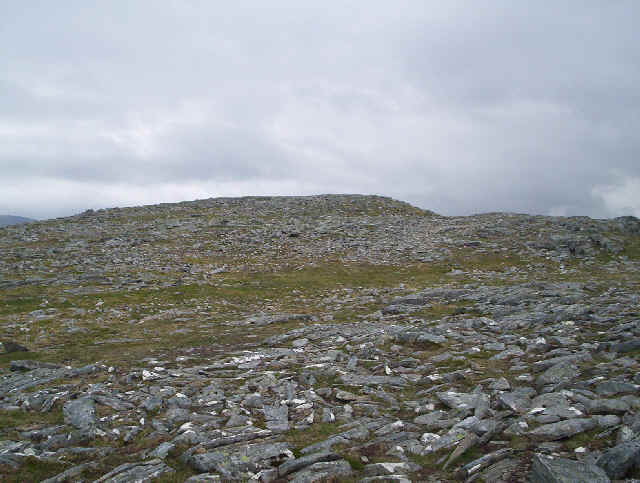 It's at NN40675 67027 and 745m above sea level. I often find that walking to a specific spot helps me when I'm finding the going tough. I'd had a twelve hour and 22mile long hike the day before and was beginning to think today wasn't going to be a good idea! 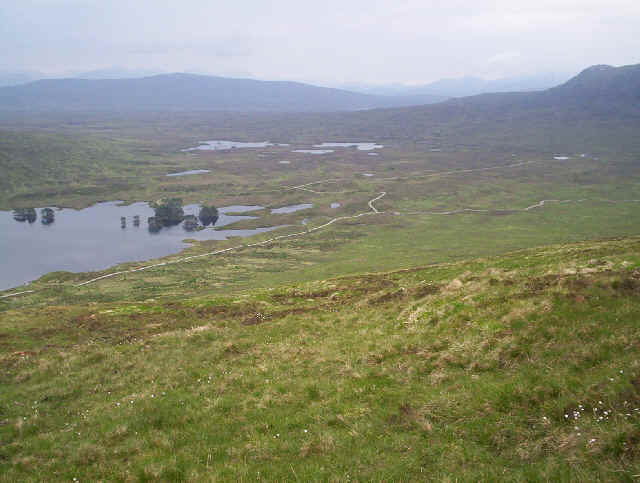 By the way, I wouldn't aim straight for Carn Dearg from Peter's Rock, as there appears to be a superb bog just to the right of the photo. 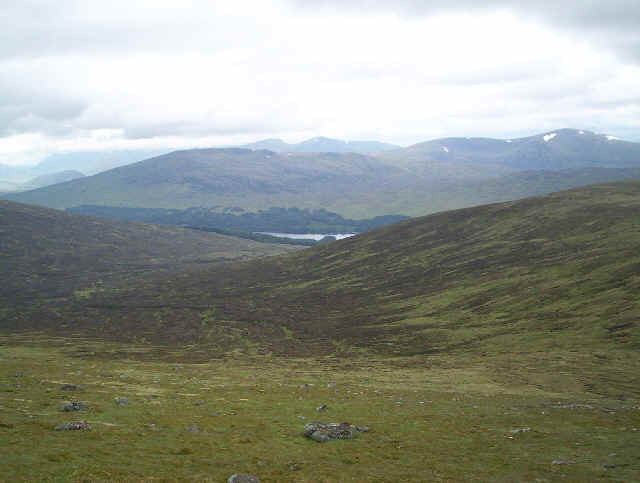 On reaching the ridge, one hour and forty minutes from Corrour, some chocolate and a hot drink did wonders for my frame of mind, as did the view of Loch Ossian and Beinn na Lap now without its cloud cover. Things were looking up and there was even a faint track along the ridge. 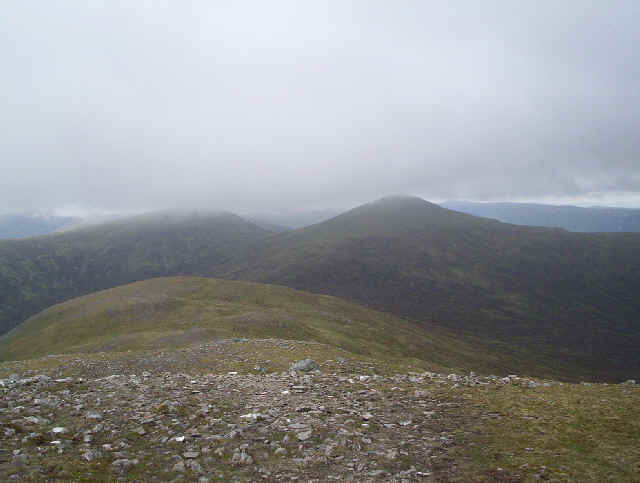 The walk to the summit was a delight even though the sky was still grey. The mist kept drifting in and out on the summit. Towards the 900m contour the hill becomes stonier but the gradient remains quite gentle. 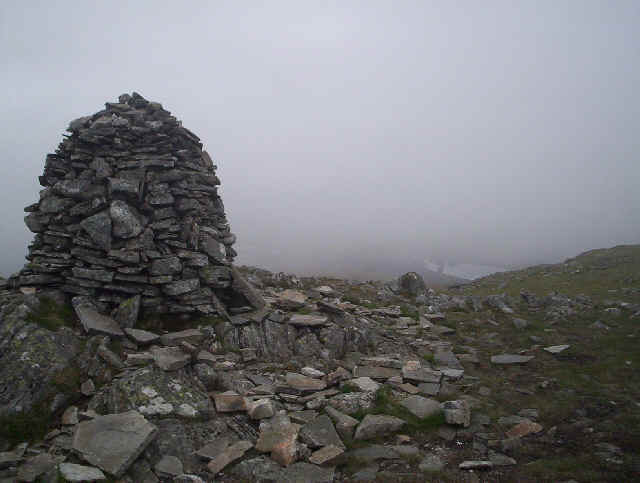 A magnificent cairn greets the walker at the summit of Carn Dearg, even if the view was rather limited. 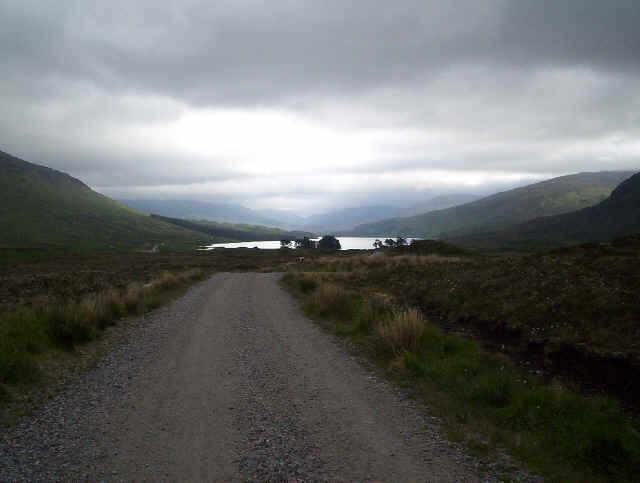 That's Loch Ossian through the gloom. 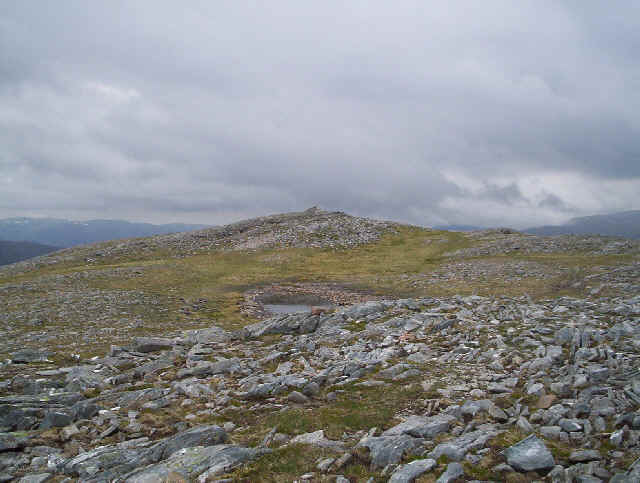 My arrival at the summit was exactly two hours twenty minutes from Corrour; precisely the time in the Ciecerone guide "Walking the Munros". This cheers me up no end! There's Orange reception at the summit so I send a message to my wife. Beyond the summit the track falls gently down to the bealach at Mam Ban. 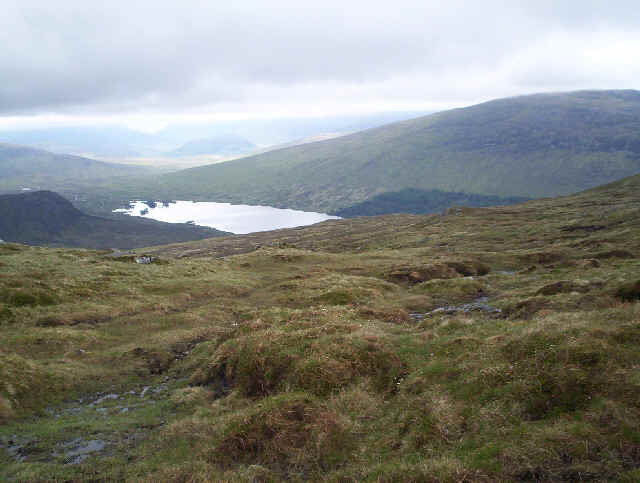 The next objective Sgor Gaibhre looms ahead but, once again, it's easy walking. 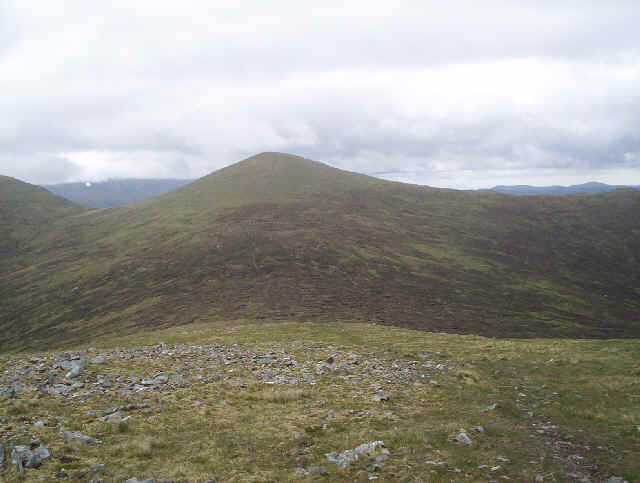 As I head down hill I meet a couple who, I discover later, are about to celebrate on Carn Dearg with a glass of champagne. 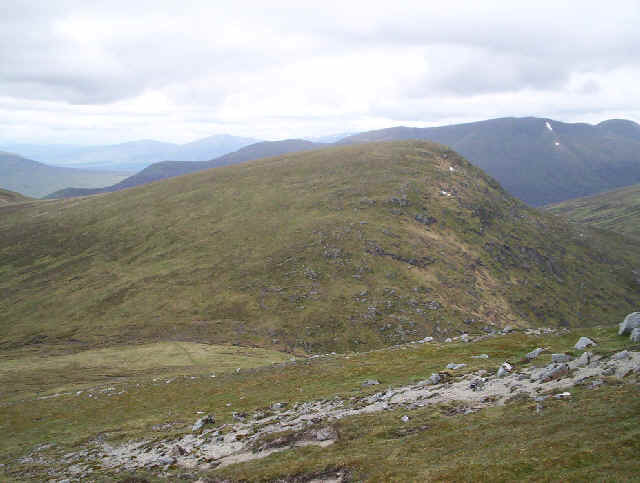 He'd completed his Munros after starting in 1969. We met later at Corrour and should you read this "Congratulations" again! The weather had brightened up considerably with Loch Laddon behind the cairn and the Blackwater Reservoir to the right. There's also Orange reception here if you move around a little. 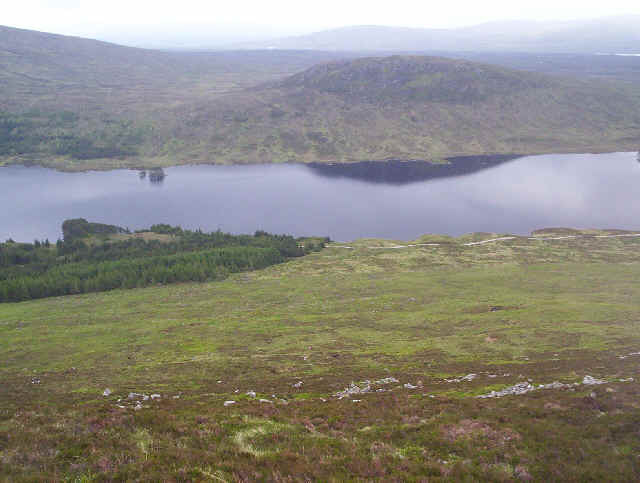 Most guide books suggest returning to Loch Ossian by walking over Sgor Choinnich, or skirting its flanks. 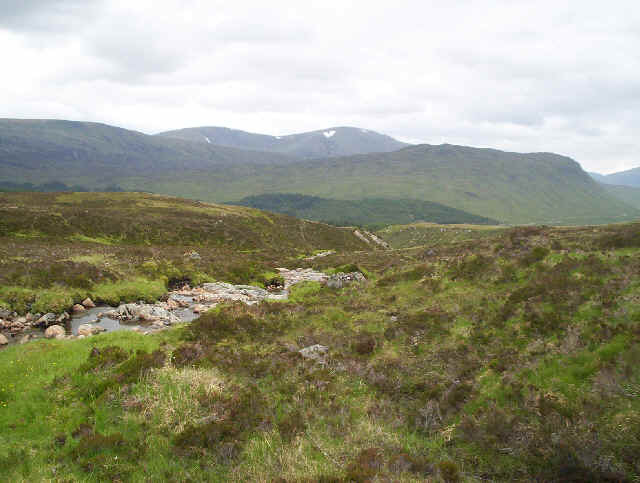 I'd decided I'd rather walk down into the valley along the Allt a' Choire Chreagaich so I headed off to the left in this photo. 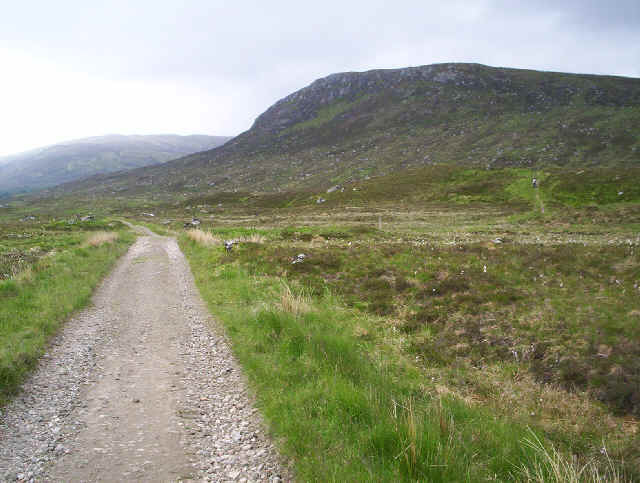 The climb from the bealach to Sgor Choinnich isn't much but I still wanted enough energy to climb Beinn na Lap and I knew that that climb was going to be steep. Dropping down into the glen I soon found the stream and for most of the way there was a faint stalker's path. The stream has cut quite a deep channel and it was this feature that allowed me on of the experiences of the day. Suddenly in front of me I saw dozens of deer, and they hadn't seen or heard me. I quietly took these photos before I was spotted. Even then most of the deer didn't seem to be too concerned and as can be seen I got very close to them before they ran away. 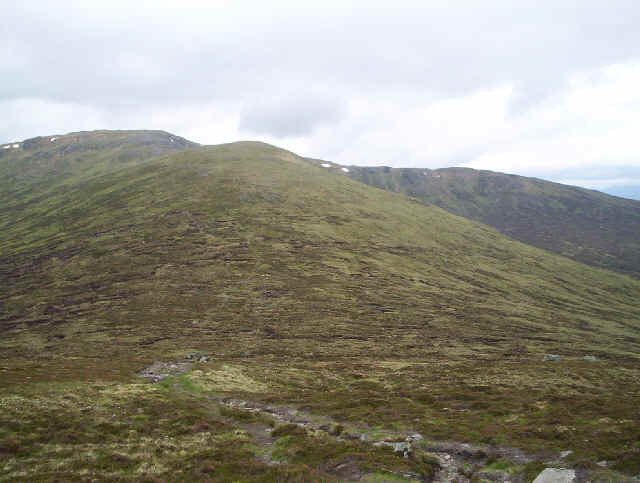 Once out of the gully I could see several hundred of the animals in the Coire Creagach. The stream continues downhill and I'd suggest anybody who uses this path crosses over to the west bank before you reach the forest edge. There's a small dam and sluice which I was able to cross easily because of the low water but in more normal conditions this might not be so easy. 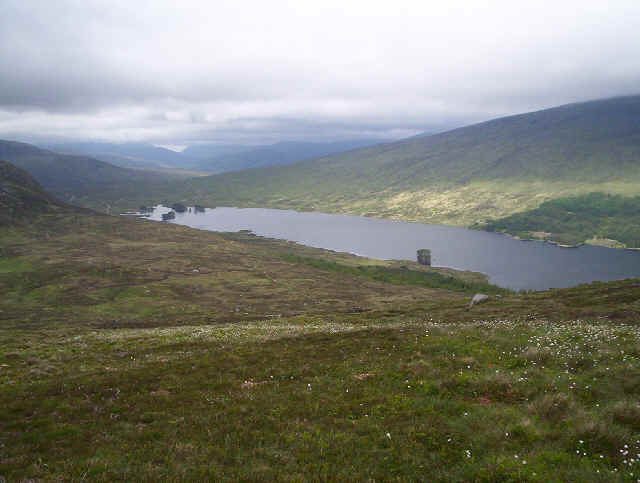 After passing through the forest and the by buildings of the Corrour Shooting Lodge I arrived at the east end of Loch Ossian five hours and twenty minutes after leaving Corrour. Clearly if I was going to catch the 18.25 service I needed to speed up a little so it was into 6km/h yomp mode along the north shore of the loch . At the end of the forest at about NN378679 I took to the hillside following the deer fence at its western end. 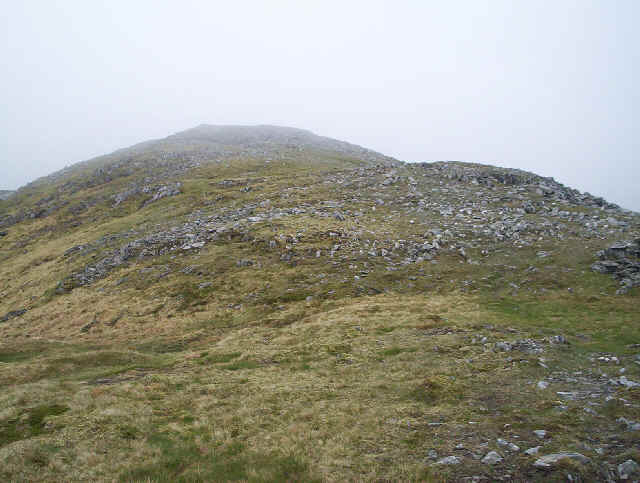 The hillside is extremely steep and without any slackening of the gradient virtually to the summit. To my dismay there was a new deer fence blocking my progress beyond the top edge of the forest but, fortunately, a few hundred feet westwards there is a stile. The hillside is not only steep it has also suffered a lot of erosion from deer hooves so great care is needed climbing through the heather. It's probably my least favourite climb ever; an hour of solid graft to climb about 500m of ascent. Eventually the gradient eases and the stony summit dome is reached. 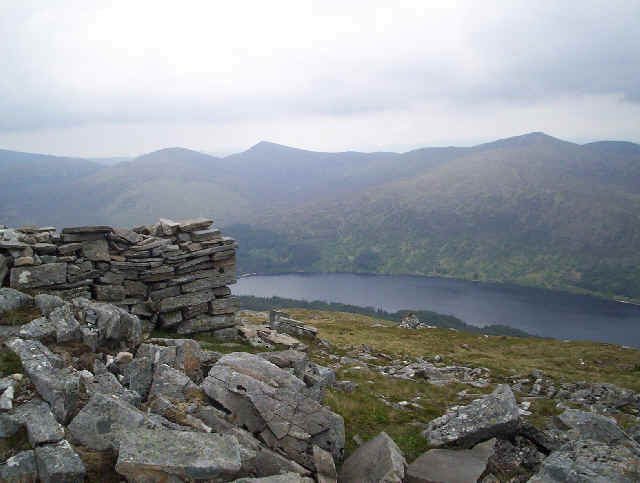 When I first saw this shelter I breathed a sigh of relief but walking around it I realised, to my dismay, that I was still some way from the summit cairn. 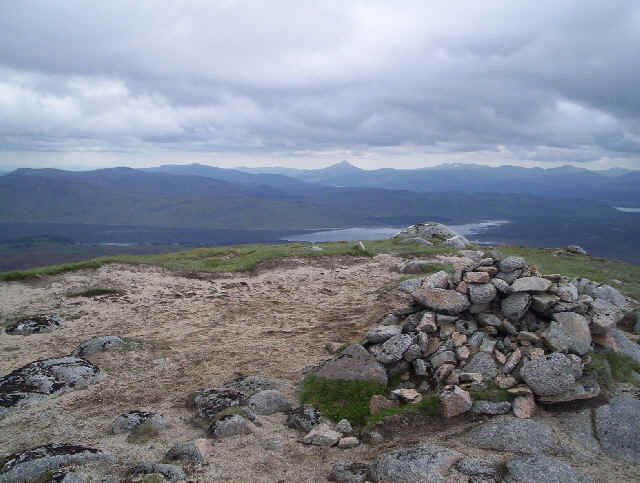 I found myself at the summit of Beinn na Lap seven hours and twenty minutes after leaving Corrour. By it was 16.25 and I was a little concerned that I wouldn't make it back to Corrour in time for the earlier train, so I didn't hang about at the summit too long. A quick text message to my wife to say where I was and a good drink of water to replace what I'd sweated out during the climb and I was off downhill. Reassuringly, the GPS gave me an arrival time at Corrour station just before the 18.25 train. By now I felt confident I was going to make the train so there was time for a last shot of Loch Ossian before descending to the new deer fence. 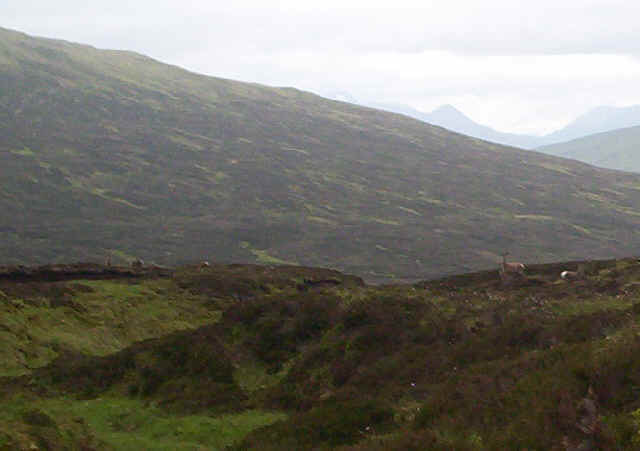 I'd spotted the stile in the distance (at NN37271 68010) and was soon back on the loch side road. Arrival back at Corrour was at 17.55 so plenty of time for a refreshing pot of tea in the restaurant. The walk had taken just short of nine hours.